Great News! The Charm City Circulator is expanding its service. In addition to the three existing routes, there will now be an additional route serving Locust Point. The new route, the Banner Route, will provide free access to attractions such as The Inner Harbor, Federal Hill, The American Visionary Art Museum, The Baltimore Museum of Industry and Fort McHenry. The new route will celebrate the bicentennial of the successful defense of Baltimore’s Harbor from the British during the War of 1812. Apart from providing access to tourist attractions, the route will also link the downtown job market and shops along Fort Avenue to several thousand neighborhood residents. The route could, however, take greater advantage of the urban fabric: it currently follows the waterfront rather than serving the busy Fort Avenue corridor. 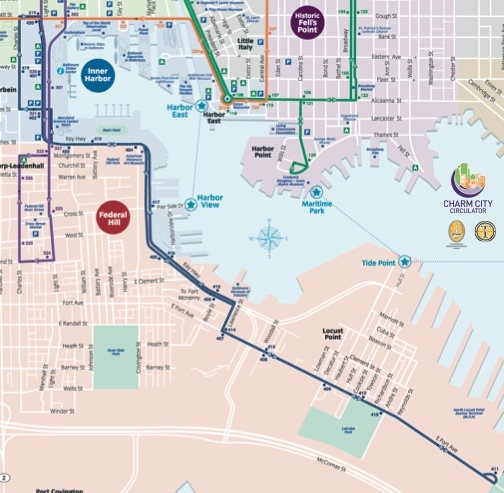 The route also misses the opportunity to connect with the circulator’s free water taxi route connecting Fells Point and Canton. Unfortunately, the Under Armour Headquarters at Tide Point, home to around 1,200 employees, will not be directly served by the circulator’s new route. Despite the lack of direct connectivity and apparent missed opportunities, the new route will still make many businesses walkable. As the primary purpose the Banner Route is to provide access to Fort McHenry, the route follows the quickest route to its end point. However, there is always the possibility that if the route can get more funding, it will be adjusted to include larger sections of Fort Avenue or to connect with Tide Point. In the State of the City address, delivered on February 13th 2012, Mayor Stephanie Rawlings-Blake made an exciting proposal to expand upon the existing Purple Route. She proposed extending service up to Johns Hopkins University’s Homewood Campus at 33rd Street. This proposal fits in perfectly with one of Bmore Urban’s core goals for the City: make its academic institutions, particularly Colleges and Universities, more accessible to restaurants, shopping and nightlife. It would be a great way to get the students currently living in the City to take greater advantage of the City’s resources, provide a boost to local businesses and, hopefully, get people new to Baltimore out to experience all the City has to offer. Johns Hopkins already has a shuttle running between its Homewood Campus, Peabody Conservatory and East Baltimore Campuses. However, the circulator would offer additional connections south of Centre Street, where the Johns Hopskins Shuttle turns east, and expand the options available to students leaving campus for extracurricular reasons. Expanded service would also make the incredible art collection at the Baltimore Museum of Art more accesible to tourists and City residents alike. The BMA boasts 90,000 works of art including the "largest holding of works by Henri Matisse in the world, as well as masterpieces by Pablo Picasso, Paul Cézanne, and Vincent van Gogh". The museum is also free to visitors. Access to the fresh food available year round at the Waverly Farmers Market is also especially important due to the large number City residents without it. The Farmers Market takes place on Saturday mornings and would be only a few blocks away from the Purple Route. 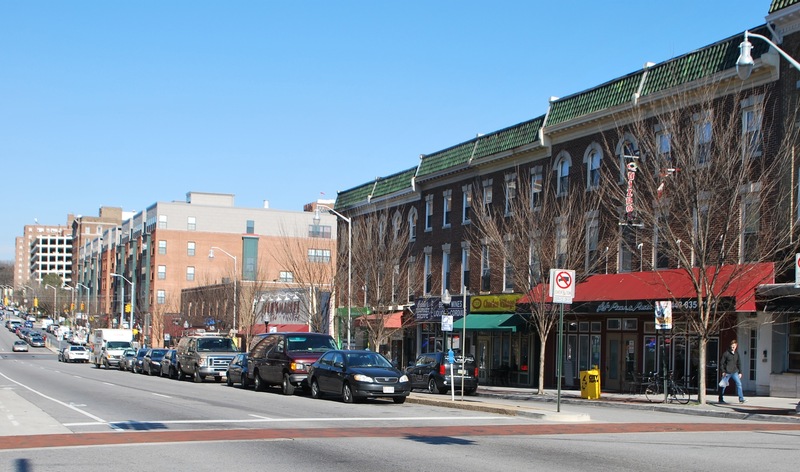 Charles Village, the neighborhood east and south of Hopkins’ Homewood Campus, is also home a to a sizable population unaffiliated with Hopkins. Providing access to this fairly densely populated corridor could help bring even more people and jobs downtown. Looking North from the corner of St. Paul Street and 31st Street: St. Paul Street is the main commercial street in Charles Village and southbound thoroughfare connecting the area to Downtown Baltimore. The Circulator already does a great job moving people around. As of January 2012, the three existing lines of the Circulator carried almost 10,000 people a day, removing thousands of automotive trips from local roads. With expanded service, that number will likely rise by several thousand riders a day.